Testing for congenital genetic conditions is probably a “no-brainer” for most breeders. Genetic testing gives someone the knowledge to selectively breed dogs in order to reduce (or even eliminate) genetic diseases in the newborn pup. As you may already know, breeding takes time and considerable resources. 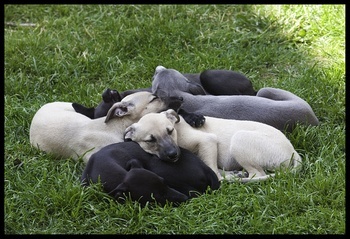 Most breeders are also emotionally invested in the dogs they breed. For many, it’s not just a hobby; it may be a full-time job or even a way of life. Congenital diseases may cause a lot of discomfort to the affected pup, and can cause anxiety for everyone involved. The cost of medical care may also be substantial. Unfortunately, euthanasia may be chosen to prevent life-long suffering of the dog. These situations may be avoided through selective breeding, which is improved by genetic testing. There are, however, many conditions that don’t show up for quite some time. If the breeder is unaware of an adult-onset condition in their dog(s), that disease may perpetuate for generations. This is because the dog is bred without knowing there is a genetic time bomb waiting to go off. I think genetic testing is even MORE important for adult-onset conditions. Let me take you through a hypothetical situation that has a very real possibility of happening. Degenerative myelopathy is an adult-onset, progressive neurological disorder found in dozens of breeds of dogs. It’s very similar to Lou Gehrig disease in people. An affected dog may not be diagnosed before breeding because of the later onset of symptoms (as late as 8 or 9 years old). Symptoms include muscle atrophy beginning in the pelvic limbs and dogs eventually become unable to walk. Owners often elect euthanasia when their dog can no longer support weight in the hind limbs. Degenerative myelopathy is caused by mutations in the SOD1 gene and is recessive. Because the disease is recessive, both copies of the SOD1 gene have a mutation in the affected individual. Remember, we have 2 copies of most of our genes. Each copy of the mutated gene was inherited, one from each parent. When dogs (or humans) reproduce, they pass only one of the two copies of each gene to the offspring. The one gene from each parent come together and are the two genes in the offspring. In the carrier, the specific gene that is passed on is random between the normal copy of the gene and the mutated copy of the gene. However, in an affected dog who has two copies of the mutation, only a mutated gene can be passed on to the next generation. Depending on how many times the dog is bred and the litter size, this mutation will be present in dozens of pups…and that is just from one affected dog. Now, multiply that by the number of dogs who actually have the condition and it is easy to see the numbers can increase quite exponentially. If genetic testing was performed for this adult-onset condition prior to breeding, this situation may be avoided altogether. Although the affected dog has the potential to lead a very full life before symptoms start to show up, by not breeding them, the presence of the gene can be greatly reduced to the following generations. Owners have been selectively breeding dogs for hundreds of years using physical symptoms alone. This is fairly straight-forward when it comes to congenital disorders of the newborn and genetic testing has the potential to enhance this. However, genetic testing has the ability to radically impact selective breeding for adult-onset conditions. Without genetic testing, it may be too late before someone realizes they have repeatedly bred a dog with a genetic condition. With genetic testing, informed decisions can be made to reduce the mutation from the population by not breeding the affected dog.